(APN) ATLANTA — The Atlanta City Council has for at least the last several years–if not the last several decades–forbidden Atlanta citizens from making public comment on zoning matters at its Full Council Meetings and at its Committee Meetings. 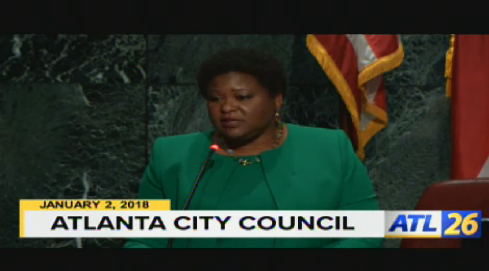 Frequently, Atlanta citizens seek to exercise their First Amendment rights to free speech and the petitioning of government for a redress of grievances by speaking on zoning matters, and the Council President or Committee Chair routinely tells them they cannot do so. Council President Moore and others have claimed that the rationale is that comments should only be made to the Zoning Review Board, and this restriction is somehow supposed to prevent the Councilmembers from accepting bribes. Most recently, numerous Atlanta residents sought to make public comment on the Westside Yards and Council President Felicia Moore told them they could not speak on the proposed development because it was a pending zoning matter. One week ago, on August 07, 2018 Atlanta Progressive News sent an email to Council President Moore asking her to provide the section of the City of Atlanta Code of Ordinances, law, or other authority that states that Atlantans can’t make public comment on zoning matters. APN also asked that such ordinance be printed in the Council Meeting agendas. “I will ask the law department to respond to your inquiries. I know the rationale has been publicly stated many times. As to print it out on the agenda, I will look into that possibility,” Moore wrote in response. To date, neither the Law Department nor Council President Moore have provided the information. APN has reviewed the relevant code sections, the City Charter, and the Rules of Council document and not found any language supporting the City’s practice. That is, neither the code section related to Remarks from the Public at Full Council (Part 1, Sec. 2-104), nor the section related to the Zoning Review Board’s public hearings (Part III, Sec. 16-27.006) state that the public cannot comment to the Full City Council about zoning matters. The code section related to Remarks from the Public at Committees (Part 1, Sec. 2-136) allows Committee Chairs to bar comments for which public hearings have been held, but this ordinance does not specify that the term public hearings includes the hearings of another body besides the City Council. The Zoning Review Board hears zoning and land use change proposals; hears from the developer and the public; and makes a recommendation to the Council. However, the City Council retains the power to make the final decision, and often takes an action inconsistent with the recommendations of the ZRB. Therefore, the City Council in its practice–which may be without legal authority–has purportedly delegated its responsibility to hear from the public regarding zoning matters to a body that it created which has no authority to make zoning decisions. Meanwhile, there is no prohibition on developers–or any member of the public–from picking up the phone and calling Councilmembers, or emailing Councilmembers, or influencing Councilmembers in any other ways. So, the prohibition on zoning comments during public comment serves only to cut off one of the ways that average citizens and low-income citizens are able to access their government. In addition, there are often issues the process by which zoning matters go before the ZRB, the Neighborhood Planning Unit system, and the Department of Planning. Cutting off public comment on zoning at City Council makes it difficult for members of the public to inform Councilmembers regarding any problems that may have occurred with that process. At today’s Community Development/Human Services Cmte Meeting, APN’s News Editor–the present writer–informed the Committee that neither Council President Moore nor the Law Department had provided the citation to legal authority. Even though members of the Law Department were present, no one opined on the matter; neither did any Councilmember present–Amir Farokhi (District 2), Ivory Lee Young (District 3), Dustin Hillis (District 9), Marci Collier Overstreet (District 11), Joyce Sheperd (District 12), or Matt Westmoreland (Post 2-at-large)–ask the Law Department to provide an answer. The right to free speech and to petition government for a redress of grievances is set forth in the First Amendment to the federal and state constitutions. Certainly the City has purview over zoning matters, so the listed exception does not apply here. APN will be following up on this matter for clarity and possible identification of appropriate further action. I would never want to live within the city of Atlanta. Give some Black people power and they become the same as the Klansmen. They attempt to cut off the 1st Amendment Right of Free Speech. They become enlarged within themselves. The citizens of Atlanta need to start a committee to start the process of voting those self-righteous politicians out of Office. Blacks or Whites should be recalled/defeated when they are not about the peoples business that put them in office.